Whether repairing a small damaged area in your floor, filling in a area where a wall has been,or extending your existing floor, the same process is used. The process is known as "feathering". 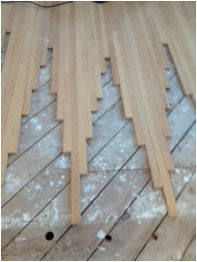 Existing floor boards are removed in a natural pattern and then replaced with new boards. Feathering creates a seamless transition. Additionally, feathering is most commonly used in repairing site finished floors but it can be applied to pre-finished floors too. Recoating is adding a single coat of clear finish. Recoating eliminates surface scratching, but not deep marring, denting or discoloration. 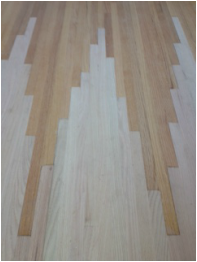 Recoating is best for newer floors that show light wear and just need refreshing. 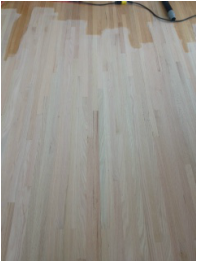 Refinishing is the same process as sanding and finishing a new floor. Your existing floor is sanded to remove existing stain and finish. This exposes a fresh blank wood canvas to be stained and finished to suit your style. Both site-finished and solid wood pre-finished floors can be re-sanded and re-finished!